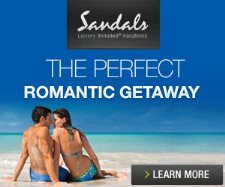 Sandals Negril Red Lane Spa, open daily 9am-7pm, offers an array of classic European spa services with a distinctive Caribbean flair, using all-natural organic products made from nourishing tropical ingredients. Red Lane Spas include Dermalogica products. The Tropical Nail Bar offers a palate of eco-vegan nail lacquers and treatments. Red Lane Spa entrance area.